About 10,000 spaces are available for sale in nearly every section of the cemetery, including the most historic. If you have relatives in Topeka Cemetery, please check with the office to see whether there may be unused spaces in the family plot. If no other arrangements have been made, ownership of burial rights passes from parent to child, with each child having equal rights. Burials are conducted six days a week, with an extra charge for a Saturday burial. Most families use the Garden Chapel for their final goodbyes. This covered patio has seating and a cement floor and can be easier to navigate than going to the graveside. Graveside services, of course, are available. A small charge is added for the setup of a tent and chairs at the graveside. An outer container is required for all burials. These may be purchased from Topeka Cemetery or from a funeral home or crematorium. Topeka Cemetery allows the burial of ashes in an existing grave, with permission of the space’s owner. A maximum of two people can be interred in a single space – one full body and one cremains, or two cremains. 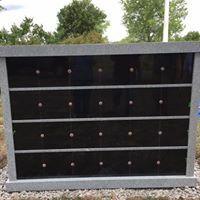 A 48-niche columbarium was added to the grounds north of the Garden Chapel in 2018. Each niche can hold the ashes of one or two people. This is an especially economical way to provide a memorial for a loved one if the family doesn’t already have ground burial space. Expression in memorials is encouraged at Topeka Cemetery. Throughout the grounds are beautiful monuments designed to help tell families’ stories. We wish to continue this tradition. The staff at Topeka Cemetery can help you design monuments, headstones, and benches to honor your loved ones. Access to a variety of vendors for stone colors and styles provides the opportunity to find just the right memorial that will tell your loved one’s story through the ages. Granite is the material seen most often in the cemetery, and it maintains its beauty over the decades. Bronze also is popular, and these memorial plaques are placed on granite bases. Prices quoted for memorials ordered through Topeka Cemetery include design, materials, shipping, and setting. Markers ordered from outside vendors may be subject to additional setting fees. The cemetery does have rules regarding materials that may be used in memorials. Size and structure also may be restricted based on the amount of space available. Please have your monument dealer check with the cemetery before ordering. Burial arrangements can be pre-paid, locking in current prices. Funds paid for burial vaults and opening and closing of the grave are placed in a merchandise trust account monitored by the Kansas Secretary of State’s Office. When headstones are ordered pre-need, they are made and delivered at the time of purchase. They may be placed on the gravesite or placed in storage, depending on the family’s wishes. The cost of cutting the final dates on the headstone may be pre-paid, and those funds will be placed in trust.